Note: If you are a student at UMass-Amherst or Bentley, please order through Collective Copies/Levellers Press (link here). If you order through us, there will likely be significant delays. 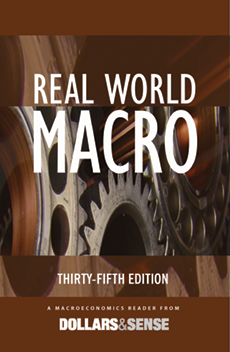 Real World Macro is a lively, thought-provoking supplement to introductory and intermediate macroeconomics textbooks. The new 35th edition asks the big questions that standard textbooks try to avoid: What's so great about growth? Is unemployment natural? Why should inequality matter? Along with covering the basics—monetary and fiscal policy, productivity and investment, inflation and unemployment—Real World Macro also looks at the so-called debt crisis, debates about taxes and their effects on macroeconomic outcomes, and arguments for and against "free trade." Chapter introductions summarize the themes examined in each article, and discussion questions help students relate macroeconomic theories to the latest real-world issues. Real World Macro’s engaging articles are drawn from the pages of Dollars & Sense, the leading magazine of popular economics. Please click on the "Table of Contents" tab above to see what's in the newly published 35th edition.